Note: When Attorney General Jeff Sessions announced the repeal of the Obama-era Justice Department memo that allowed states to put in place legal marijuana, there was worry that there would be prosecutions of legal marijuana establishments around the country. 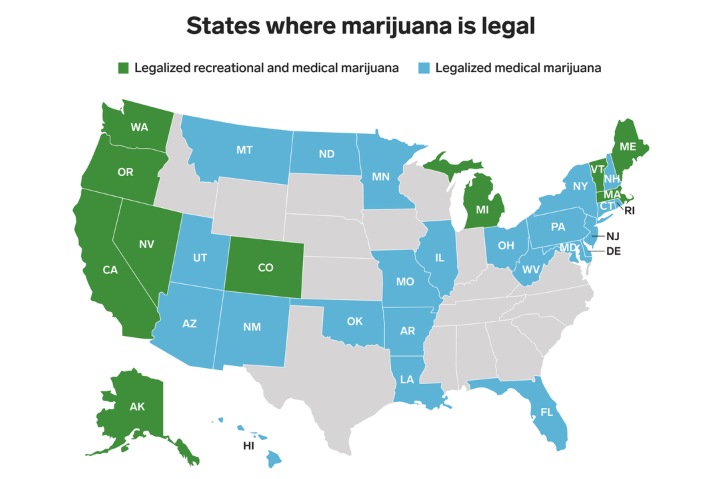 Ten states and the District of Columbia have adult legal marijuana and 33 states have legalized the medical use of marijuana. If US Attorneys around the country could now prosecute the dispensaries of those states the momentum toward legalizing marijuana would be ended. Exactly one year ago, then-Attorney General Jeff Sessions stoked fears in the marijuana industry by rescinding an Obama-era Justice Department memo that encouraged federal prosecutors to generally not interfere with state cannabis legalization laws. But in the year since, the government has not launched a crackdown, five more states legalized cannabis in some form—with Vermont lawmakers voting to do so on the very same day Sessions made his move—and federal prosecutions for marijuana-related offenses during the 2018 fiscal year, which ended in September, declined by almost a fifth. While the Obama guidance, known as the Cole memo, provided the legal industry with some sense of comfort, advising U.S. attorneys to exercise discretion and enforce federal law in a limited number of circumstances, its rescission hasn’t halted the progress of the reform movement. If anything, Sessions’s decision to do away with the document seems to have emboldened marijuana-friendly lawmakers at the state and federal levels. In Congress, an outpouring of condemnation and vows to protect legal states against federal interference followed last year’s announcement. Sen. Cory Gardner (R-CO) went so far as to threaten to block Justice Department nominees unless the Trump administration committed to grant states the autonomy to set their own cannabis policies. And later in the year, he got the president’s backing on a bipartisan bill to exempt legal states from federal marijuana enforcement under the Controlled Substances Act. There seems to be a consensus among leading marijuana policy reform advocates that Sessions’s move, even if it had negative short-term financial implications for some businesses, ended up inadvertently helping to advance the legalization agenda in the long term. “I think that [the rescission] certainly backfired and had some unintended consequences for Mr. Sessions in that any real change that came out of the rescission of the memo arguably was supportive of the industry and that it really galvanized support for states’ rights and marijuana reform at the federal level in Congress in a way that we’ve really never seen before,” Aaron Smith, co-founder and executive director of the National Cannabis Industry Association, said in a phone interview. It’s also worth noting that the Justice Department, which remains largely operational in spite of the federal government shutdown, has so far declined to interfere in state-legal medical marijuana activities—even though a rider blocking the agency from spending money for such enforcement has expired for now. Of course, Trump’s new attorney general nominee, William Barr, could always direct the agency to adopt a more intensive enforcement protocol, but there haven’t yet been any signals that he considers federal marijuana prohibition a priority. All told, the post-Cole memo world might have left federal prosecutors without explicit guidance, but the sky hasn’t fallen and the legalization movement marches on—by most accounts stronger than ever.